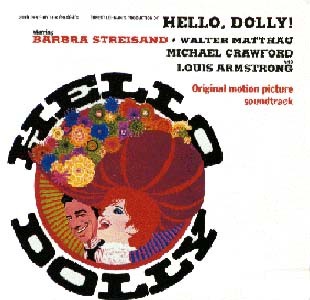 The Ultimate Barbra Streisand Album Experience: "Hello, Dolly1 (Original Motion Picture Soundtrack Album)"
Producer (1969 Release): Murray Spivack. Proucer (1994 Release): Nick Redman. This was the second of three albums to Prominantly Feature Barbra not to be released through Columbia Records. The first was "Funny Girl (Broadway)" and the third was "Funny Lady." One single was released commercailly from this soundtrack, "Before The Parade Passes By." The single version is slightly edited and contains a refrain of "Hello, Dolly!" as an intro. The second single release was only released to radio stations and was for "Hello, Dolly!" This single was a slightly remixed version of the title song and was edited down to 4:40. Two catalog numbers are listed above as the first is the original release on Vinyl and the second is for the Remastered and Remixed 1994 Compact Disc Re-issue. To purchase this album, please click the banner below to visit amazon.com. �1996-2001 The Ultimate Barbra Streisand Experience. Heath David Castor, Webmaster.